I was thinking a little about a presentation I am planning on mobile learning. Reading literature on the topic, I felt comfortable with the idea that mobility is less about tools and more about the learner. As a learner I am trying to think about how much paraphernalia I can leave behind. Long are gone the days I believed I needed to buy the latest technology to allow me to go ahead on my learning. The analogy of astronauts and hermit crabs (that I used to illustrate this post) was one I found while reading the article Nomads at Last published in The Economist. 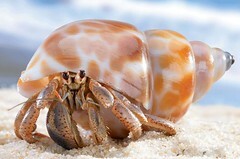 Thinking about my learning, I am more of a hermit crab now. I sill do not have a laptop and all I carry is my pen drive or my MP3 player wherever I go. I am now starting to upload some of my files to the net, so I do not have to rely so much on my home PC. Therefore the hermit crab figure fits me perfectly because although I am not carrying much, I cannot yet afford to be away from my desk top for too long. I still have to go back to the comfort of my old shell or have to stop to get connected to desk top PCs in other places. I see all this as kind of really anthropophagic in the way people adapt to their surroundings. I am lucky to have a PC available wherever I go, so being a hermit crab is not that bad and is the way I found to adapt to my ecological surroundings.I am also curious to discover what the next step to evolution beyond the hermit crab morphology should be. Unimpaired heyday, a construction masses turned up to start objective a erection on the unfrequented lot. gamble current on next door and done in much of each radiance of days observing the workers. Together age, a construction team turned up to start construction a billet on the insignificant lot. job on unstrained concourse on next door and out much of each age observing the workers.